Boulder Magazine’s compelling stories, in-depth guides and entertainment-filled calendar give locals and visitors alike an insider’s look at progressive Boulder, Colo. through three information-packed issues every year. Boulder County, a vibrant community of 300,000 residents straddling the Rocky Mountain foothills, is recognized worldwide as home to the University of Colorado, numerous high-tech firms and a very active outdoor lifestyle. Simply, Boulder is an enchanting community with a very attractive demographic profile* — a median income of $74,000 annually and the highest percentage of college graduates in Colorado (42%). 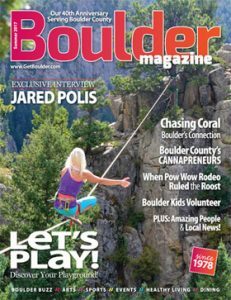 Serving Boulder County since 1978, Boulder Magazine’s stylish layout is presented in a perfect-bound, coated-stock, 4-color magazine that is published every Memorial Day (summer issue), Labor Day (fall issue) and Thanksgiving (winter/spring issue). The informative sections are a popular mainstay of Boulder Magazine, covering local events, the arts, sports, dining and nightlife with complete listings and descriptions of upcoming activities. 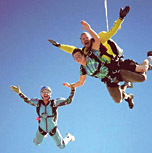 These sections — the definitive sources for finding fun and entertainment — provide a unique targeted consumer market for related businesses in a publication with an exceptional shelf life. The wide-ranging calendar provides the county’s premier day-by-day listing of events, making it a ‘must have’ for residents and visitors throughout Boulder County. Boulder Magazine’s editorial content reflects the progressive community; stories range from in-depth interviews with community leaders to a look at people who have the area’s coolest jobs. Every issue overflows with well-crafted features on local musicians, artists, community activities and colorful folks. Boulder Magazine is unmatched for presenting the true “Boulder lifestyle” to 250,000 readers of every informative issue. Statistics show that visitors to GetBoulder.com return again and again for complete information about restaurants and nightlife, movies, arts, events and lodging. And, because of it’s high search engine query ranking, getboulder.com is Boulder’s premiere portal to bring new and returning visitors to YOUR website. FOR FULL PAGE ADS WITH A BLEED: Please keep all essential artwork within the safety zone to ensure nothing is cut off in the trim process. • Adobe Illustrator CS3Please send electronic files via e-mail to your respective Sales Representative or on a CD (Macintosh formatted). REMEMBER TO SEND supporting files and fonts!Please use the Brock Publishing Design Checklist (brock-designchecklist08) to assist us in providing you with the highest quality reproduction of your ad. Web ads should be RGB jpegs saved at 72dpi. For in-depth information on how Boulder Magazine will benefit your enterprise call 303.443.0600 or 1.800.903.2532. 1x, 2x and 3x rates. Special position ads at additional charge. Download our design checklist (brock-designchecklist08) for picture perfect ads. Submit web-ready jpegs in RGB format at 72dpi.